Every audiophile who has experimented with better power cables has heard the performance advantage they offer. Indeed, the amount of improvement can be astounding, often transforming a system from good to amazing. As audiophiles, we trust our ears but it’s hard to understand how replacing just one short link in a long chain of the power delivery system can have such a dramatic impact. The following article is intended to answer those questions. Vienna Philharmonic, Sky Walker Studios, Crest National Studios, Astoria Studios, Audio Research, Wilson Audio, BAT, Meridian, VTL, Bel Canto, Halcro, to name just a few. To follow is a response from Mr. Gabriel that appeared in an on line forum addressing question why power can be such an influential addition to a system. Misconception #1: AC Power is like water coming from a large power tank, flowing through several 10s of feet of power hose into a component. This implies that the component is at the end of this system. Misconception #2: AC power can be contaminated just like water in a hose. This implies that once the water is contaminated at some point up stream, that is must be cleansed before it arrives at the audio component. 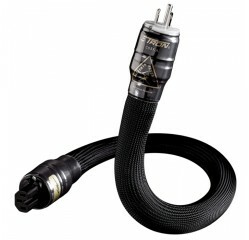 Answer: “As stated in #1, the component is not at the end of the power hose. It is between two power hoses and the current is oscillating back and forth. Further, current is not like water at all. Electrons cannot be contaminated. There are two aspects to power transmission: the electromagnetic wave and the current flow. The current itself cannot be contaminated but the electromagnetic wave can be modulated with other frequencies. We usually call these other frequencies noise or Electromagnetic Interference (EMI). Within the various parts of a power circuit there may be EMI in certain parts that is not present in others. Electromagnetic energy can be transformed or redirected to lessen their effects. Misconception #3: There is up to a hundred feet of wire in the walls, so the last 6 feet of power cord can't possibly make any difference. Misconception #4: There is a tremendous amount of electrical interference and EMI coming from outside the home that we need to protect our equipment from. This implies that we need some sort of power conditioner or filter to protect the equipment. Answer: “Most of the EMI that affects the audio quality of a system is generated by the audio components themselves. Electromagnetic waves that traveling through space dissipate in power at the square of the distance from the source. Further, very high frequencies that propagate through the power circuit do not survive for long. Power lines present a high impedance to MHz and GHz signals due to the relatively high inductance of power lines. Misconception #5: There is some sort of conspiracy among audio designers that keeps them from producing a "proper" power supply that is not affect by power cable quality. Answer: “This concept is like saying that if a speaker where properly designed, you wouldn't need to use a good quality speaker cable. PowerSnakes have been tested with the most modest of mid-fi equipment and the most exotic state of the art components. We have yet to find a component that cannot be improved by replacing the power cord. Answer: “There are some power cords that ARE designed this way. Some even insert capacitors within the cable to further increase capacitance. This approach has some positives and many negatives including the reactive interference with the way many power supplies are designed. Misconception #7: Power cords are just like speaker cables; always the shorter the cable the better. Answer: “Some speaker cable designers would argue that a speaker cable below a certain length is not better. We will let them address the issue if they desire. "A speaker cable conducts an audio signal from the power amplifier to the speaker. The distance is quite small, on the order of a couple of feet to several feet. The quality of a speaker cable is determined by how well it can transmit the signal from the amplifier to the speaker without alteration. "A power cable on the other hand is not transmitting a signal. It is conducting A.C. power and its sonic superiority will be determined by its ability to deliver current (steady-state and instantaneous) and its ability to deal with the EMI effects of the components to which it is attached. "Since a power cord is composed of a hot and neutral wire that the component sits between, a change in the length of the cord will increase the size of the "buffer" around the component. In general, I would not recommend a power cord that is shorter than 3 feet or 1 meter in length. But subtle degrees of audio performance are not the only consideration when putting together an audio system. Esthetics is also important especially when the system is located in a beautiful home. I just point out the performance differences so that people can make an informed decision when determining the optimum length for their cables. “Before we produced our first power cord, we did extensive testing of the audible effects of a variety of devices and materials associated with power transmission. We created many jigs and test apparatus that allowed us to test wire types, dielectric materials, connector contacts, dampening materials and a variety of transformers, chokes, coils, ferrites, capacitors, triacs and diacs. After 3 years of testing, we concluded that just about anything and everything that is inserted in or around the electromagnetic field of a power circuit has an audible effect. Some of the effects are quite small and are relatively insignificant. Others are dramatically profound and sometimes surprising in their behavior. Obviously we are not going to "give away the farm" and discuss all of our findings, but there are some very basic observations that I can share with you. "First would be that wire type and size in a power cord is highly overrated. Every wire type (I am talking about the metal itself) has a specific sonic characteristic. Silver, copper, brass, gold and others all "sound" different. The difference in sound is not related to conductivity capacity because we adjusted the sizes during testing to account for this. Each of the metal's inherent "sonics" can be ameliorated by careful adjustment of the other materials used in the construction of the final cable. We have a warehouse full of various prototype cables that never made it to production. Some of these use a relatively small wire size of ~18ga, that sounds surprising full in the bass. Intuitively, you might think that a small wire would sound thin in the bass region. This is not always the case. Conversely, we have some cables with wire as large as 1gauge that sound powerful in the bass but are also flabby and irregular sounding. So, just increasing the wire size is not the easy answer that some might think. "Most of what I have to say here are my "conclusions" based upon observation through trial and error testing. Furthermore, there are no perfect components and there are no perfect parts. Everything is relative and the designer must weigh the sonic value of each part when designing a product. Our philosophy is to create a product that is a faithful musical component as opposed to striving for excellence in any single performance area. "Our tests with coils and chokes indicate that (in general, with exceptions) that any coil or choke that is placed in-line with the power circuit is harmful to dynamics. Many of them will also induce a subtle smearing or blurring of transients. This is naturally dependent upon the power supply design of the unit that the coil is used with. Coils and chokes are necessary in most components and I prefer "single layer wound" types such as the foil designs. Cost of production will always mitigate against the use of these types of coils due to the expense. We definitely do not believe in placing coils or capacitors within a power cable. These devices belong in the component or in a dedicated power conditioner. "Many components use a power inlet IEC that has an integrated "L" or "pi" filter. The quality of these devices varies dramatically. Generally speaking, the more capacitors and inductors that you have in a circuit, the more complex the dynamic interactions will be between the devices. This will also make the component they are used in more reactive and the possibility of negative sonic effects increase. Multiple filter networks can resonate and generate unintended results that have subtle but audible ringing / pinging sounds. Many of these IEC packages were created for office and computer products and are required to pass certification tests for EMI emissions. All I can say is that what is good for a fax machine is not necessarily good for a pre-amplifier.